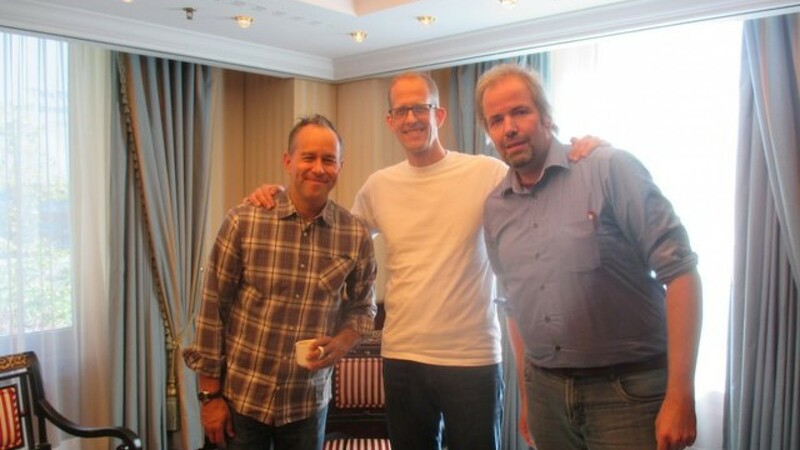 (c) Interview und Niederschrift Johannes Wolters – alle Rechte vorbehalten! Johannes: I have to admit, that your film moved me on a very personal level. Last year my mother died of dementia, she lost her memories and she changed very much in her personality during her illness. Inside Out has a very similar theme, how to deal with loss and sadness and the setting is the mind. 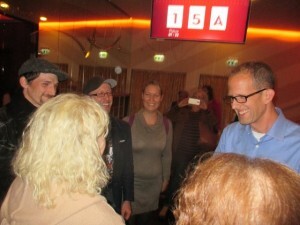 Pete Docter: I am very sorry about your loss! I think this is probably one of the most painful ways to lose somebody. That is awful. Jonas Rivera: I lost my Grandmother while making this film with the same thing and it did make me think while we were talking memories in the movie – it was a bit of a mindwarping experience. I have to apologize for that. 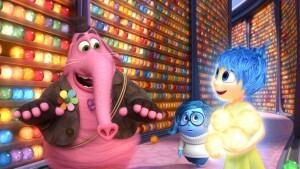 Pete Docter: That is the purpose of Sadness and on one level we played right into that in the film of course. On one level you don´t want to feel sad. And so you try to push away and avoid the things that gonna make you feel that. And yet the purpose of Sadness from an evolutionary standpoint, from a biological standpoint, this is from the research we did, the purpose of it is to help you deal with those inevitable losses. You cannot go on with life, now your mother is gone. Right? Things are gonna be different. So sadness forces you to slow down, to recover, to allow for healing and to reassess, how am I going to approach my life now, after this change has happened. So it is a very important and vital step and selfprotection, really. So to avoid it is to do yourself a disservice, I think. That is what the film is all about! Johannes: And you disguised it as a funny comedy! Pete Docter: Yes. “Just” a fun movie. Johannes: How did you come away with that? Jonas Rivera: I think, we discovered this. 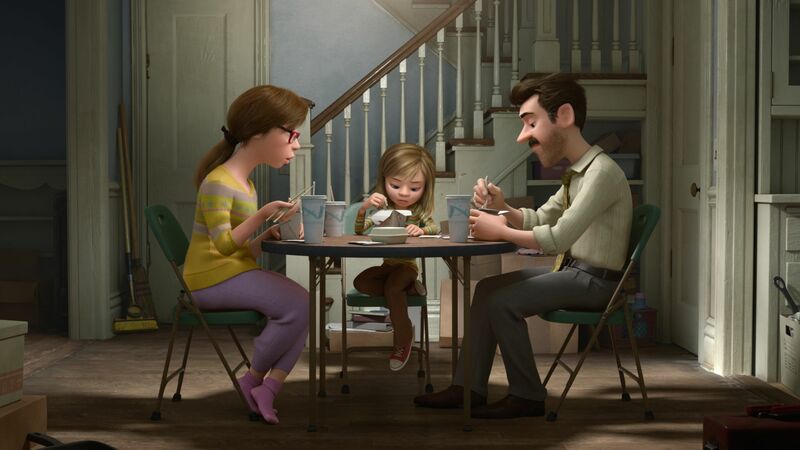 I mean, when you (turns to Pete Docter) first pitched it to me, it was a wonderful , I was sitting forward in a chair because it was just a really simple top line pitch of what if we could personify emotions and tell a story about a little girl. But she is the setting, not the main character. Pete Docter: That is just the Concept! Jonas Rivera: Yes, that is just the concept. And based on an observation you had on your daughter, which I know and have seen grown up and change, and my kids are young and all of a sudden after a few days it became this fun, but deep well and it was really all about fun and comedy “We will have a great time!” it will be our seven dwarves these emotions if we can pinpoint them down – and then when we begun to dug in, we all started experiencing “oh! this might be a deeper well than we may have thought – oh, we might have a shot here to… – now only to tell a fun story but we have a little bit of something to say” I guess. This is one way to say it! Pete Docter: The initial attraction was just the comedy, the potential of these comedic characters, of what animation really does. You know, strong opinionated exuberant exaggerated characters: And then the next step I think was discovering: “Wait a minute!” We can go into the mind. Which is somewhere everyone kind of thought about but no one has seen before. This is our chance to bring something that people are familiar with, but do not know what it looks like. So that is a great place to be. Because you see, if you do something so weird and wild, characters are melting and every building is on fire, you are kinda like “hey! Ah, what is this?”, you know! But if it is so familiar that you are bored with it, that is no good either, so this was I think right down the middle, at least it had that potential to do that, and then as you say the subject matters itself lends it to talking about that thing, which is, and that was kind of not totally there at the beginning that was something we discovered, I remember specifically one walk that I went on, when the film was not working realizing that the thing that is to me the most crucial in my life, are relationships and the thing that is at the heart of the strongest relationships that I have, are not just joy, but sadness and anger and fear and all the different emotions that is what create a real depth and the connection between people, and so the subject matter that we have choosen, because it was fun and funny actually is the crucial like bedrock of the most important thing in our lives, you know, and that is I think, when we were really able to dig in and say okay now we know what it is about. Pete Docter: Well, we did! In fact we still have pictures of this whiteboard room we had in the beginning: “We wanna be happy in life!” That was our thesis! And then our antithesis: “Well, but Life is not like that! It is full of loss and pain!” And so the third act is like: The only way to deal with all of that is to fold it to that, all of it is part of the joy of life! But this is easy to say and it is another thing to actually make it coming to life on a screen in a dramatic way. Jonas Rivera: With a character that is appealing!!! Because this is a story about being in denial a little bit. Which it is now! It took a long, long time to feather that in, didn´t it? Pete Docter: Totally! Yeah! That is what drove us to push Toy Story as a Buddy movie, at that time, there was an unwritten rule: if it is animated, it has to be a musical!”. There is nothing wrong with musicals but I think animation can do as Brad Birds fun saying: you can do a horror film! You can do action adventure, you can do any numbers of things and yet we seem to continue to head down that road! I think we are guilty of that too, we could really push things! Johannes: Do you think we will see that horror movie in the future? Or something like an Ingmar Bergman Film, because you pushed the limit here very much towards this direction? Pete Docter: There has been already a couple of interesting movies. What’s the name of the Israeli movie? Waltz with Bashir! They are very personal! And while computers become more accessible, cheaper, – may be not in the sort of lavish, lush style that pixar films with the rendering that is a fairly time intensive process – but there is a lot of different ways you could create great looks and I think that would be really fun to see. Jonas Rivera: Yes I think so too. Tomm Moore´s films are very sophisticated, almost like Lullabies of folk tales. But I also look back and I think Cinderella in the 1950ies is almost like a Douglas Sirk family melodrama with a happy ending. There have been moments in those films, on one level they have been Disney films with songs, but on another level there is a real sophistication to them. And that is sort of what I think that is exciting. We have done our best to push things forward and we look forward to doing that more. Johannes: I think, you will win the Academy Award for best animated feature film because of this terrific dinner sequence in the beginning, but I think also that you should win Best Film because of the Bing Bong character and everything connected to that. This was in my opinion new unchartered territory, something I have not seen before. Worse than death, he is forgotten. How did you come up with this? 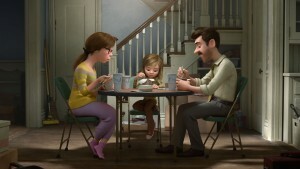 Pete Docter: That was in stages. Bing Bong was initially part of a larger group of characters that were not longer relevant to Riley. Riley as a three, four year old kid, she would draw certain characters like this funny stick figure of a woman, a dog, a corner of the sun. You know, how kids will draw the sun, the corner of the sun coming on the page – the character then would move into the frame and that is all he was , a yellow pie slice! Jonas Rivera: They were in jail! It was really funny! Johannes: At this moment, the film becomes all grey and monochromatic, a very uncomfortable moment and then you bring in the comedy again by the character of fear breathing into a bag to calm himself. Pete Docter: Oh this was Ed Cadmull´s joke! That is the one joke that Ed Cadmull has ever written into one of our movies. Jonas Rivera: And you have to know that Ed is not known for his comedy charms! Johannes: It is unbelievable how clever you establish the entire world of the movie in the first 15 minutes, which culminates into this fascinating dinner sequence. How long did that take? The thing I liked about it was, in a film you feel like okay there are a number of cards on the table and you feel like: these are the cards I am gonna playing with now for the rest of the film – and about that time we threw in another card of going into the parents brains too. Johannes: This must be hell to choose from all the ideas and gags, all those possibilities. You can see all the stuff, the ideas in the movie, for instance the brilliant gag about the crates filled with facts and opinions, to choose must be hell! Jonas Rivera: A quick thing I can tell you about that joke: my son is four, and this joke is one of those moments, people say this a laugh for adults and he was seeing it for the first time sitting on my wife´s lap and he laughed hysterically and I was thinking, there is noooo way, that he could have understood this and I asked my wife “he laughed at the facts and opinions joke?” She said, He laughed because they spilled the crates! Great – for him somebody knocked something over and this is funny – when he gets twelve or so, he wil get the real joke then!